Multiscale Designer is an efficient tool for development and simulation of multiscale material models of continuous, woven, and/or chopped fiber composites, honeycomb cores, reinforced concrete, soil, bones, and various other heterogeneous materials. Applications include multiscale material modeling for design, ultimate failure, statistical-based material allowables, fatigue, fracture, impact, crash, environmental degradation, and multiphysics simulations and provides plugins to commercial FEA solvers Optistruct, RADIOSS, LS-DYNA, and Abaqus. While a number of multiscale modeling frameworks exist, Multiscale Designer provides unmatched combination of practicality, mathematical rigor, validation, and versatility. 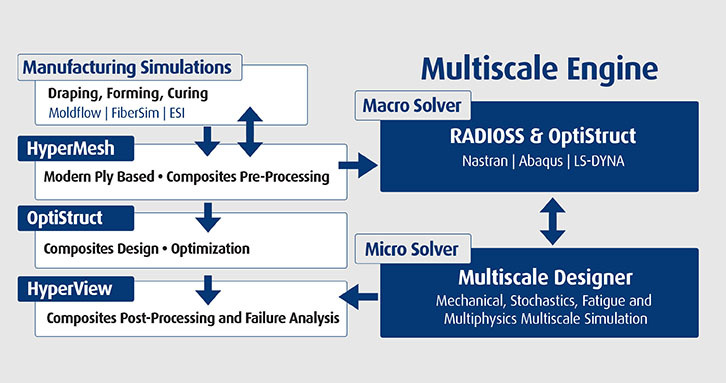 Multiscale Designer is equipped with a systematic model reduction technology that reduces complex unit cells, having hundreds of thousands of finite elements, to a manageable number of deformation modes and state variables. The optimal kinematics (modes and state variables) are automatically selected to provide the desired level of accuracy for quantities of interest. Multiscale Designer is equipped with an extensible parametric library of unit cell models generated automatically using built-in CAD and meshing tools that permit optimization and stochastic simulations. The current parametric library of unit cell models includes; continuous fiber, woven fabrics, short and long chopped fiber, ordered particles, and random particle microstructures. This eliminates the overhead of generating complex unit cell models and their linkage to macroscale FEA solvers. In addition to the parametric library of unit cells, user defined unit cell models (CAD and/or FEA mesh) can be imported and/or generated entirely within Multiscale Designer. Multiscale Designer is free of scale separation and provides mesh insensitive results inherent to competing multiscale products. The characteristic material length scale is automatically identified by Multiscale Designer based on user-specified experimental data at the coupon-level. Multiscale Designer is equipped with stochastic multiscale capabilities that translate geometrical and material uncertainties into macro-level component uncertainties. Multiscale Designer is integrated with an experimental material database and a multi-step optimization engine that identifies model parameters having a high degree of uncertainty (such as void content, micro-cracks, interface/interphase properties). Advanced Multiscale Designer features include; generation of A- and B-basis allowable material properties with minimum testing without compromising on accuracy, microstructural optimization, multiscale fatigue, and multiscale multiphysics. Multiscale Designer - Mechanical is based on a micromechanical approach that possesses a minimal number of internal variables representing inelastic deformation of the microphases and their interfaces. It resolves microscale fields at a computational cost comparable to that of macroscale modeling. Multiscale Designer - Mechanical precomputes a material database, such as transformation influence functions, in the preprocessing stage prior to nonlinear analysis, which is subsequently reused in the nonlinear analysis. Multiscale Designer - Mechanical has been validated against more than 50 benchmark problems at the coupon and component levels with various composite product forms. Multiscale Designer - Stochastics provides forward and inverse stochastic simulation capabilities. The forward stochastic simulation process computes a probability distribution function for macroscale quantities of interest given the variability of the microscale geometry and constitutive properties. The inverse stochastic simulation process reverse engineers the probability distribution function of the microscale constitutive properties based on the variability of the experimental data at a macroscale (coupon) level. Multiscale Designer – Stochastics provides the data for the calculation of A- and B-basis allowables via a virtual allowables supported by test methodology. Multiscale Designer - Fatigue is based on the two-scale asymptotic homogenization approach in time, and reduced order homogenization in space, that can be effectively applied to any material architecture and any constitutive equations of microphases. Multiscale Designer - Fatigue has been validated for chemical vapor Infiltrated (CVI), melt Infiltrated (MI) ceramic composites, and PMR-15 and MVK-14 reinforced carbon fiber composites. Multiscale Designer - Multiphysics is based on the unified coupled multiscale mechano-diffusion-reaction model of environmental degradation of polymer and ceramic matrix composites. Mulitscale Designer - Mulitphysics couples multiple physical processes at multiple scales, including oxygen and/or moisture diffusion, reaction, and deformation. 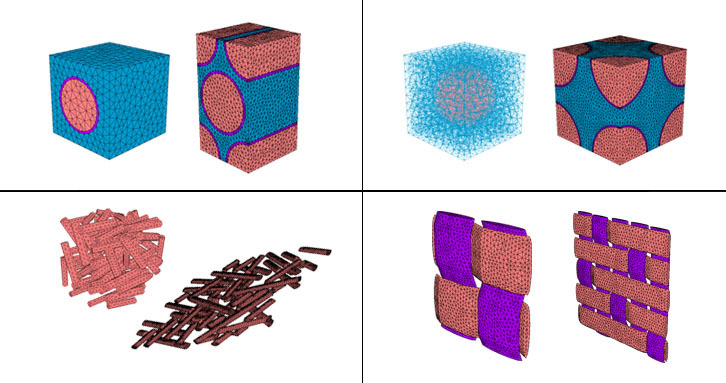 The salient feature of Multiscale Designer - Multiphysics is its computational efficiency accomplished through model reduction for multiple physical processes. Multiscale Designer - Multiphysics has been validated for PMR-15 and MVK-14 reinforced carbon fiber composite and Melt Infiltrated CMC-NASA N24A material systems.